Stephen has long held a keen interest in the Melbourne property market and commenced his real estate career in 1983. A consistently strong performer in Stonnington & Boroondara, Stephen has built a solid client base from many different walks of life. Stephen was awarded a Full Estate Agent's License in 1989. He has a strong academic background with an MBA from Melbourne Business School and a Marketing Degree from Swinburne. “My professional training has focused on negotiation and marketing, and this has given me a real edge, particularly in dealing with high-end property transactions”, he explains. A long term resident of both Stonnington and Boroondara, he currently lives in the Golf Links Estate in Camberwell. When not helping clients, Stephen enjoys spending time with his children, his motorcycles and his passion for photography. We retained Stephen Gough of Marshall White to sell our property in Camberwell. We found Stephen to be very experiences, knowledgeable and professional, and he worked hard throughout the campaign to generate interest in the property and attract as many bidders to the auction as possible. We were delighted with the result, with the property selling at over 20% higher that the reserve, and we would not hesitate in highly recommending Stephen and the Marshall White team to prospective clients. After discussions with five Real Estate Companies, we selected Stephen Gough and Antony Woodley of Marshall White to sell our property in Kew. The result was a successful sale. The process was professionally managed by Stephen who prepared a well thought out plan and closely managed its implementation. He continually added various ideas and nuances as the need became clear and his assessment of various candidates was sound. In fact all identified likely purchasers bid at the auction. His communication was exceptionally good. Antony assisted throughout, and conducted a well - structured and successful auction. They both attended all open days and cultivated prospective purchasers in thoughtful and subtle ways. They were both efficient, professional and very easy to work with. Based on our experience I am more than happy to recommend both Stephen and Antony to anyone considering selling their home. A week has passed since the auction and I think I’ve just come back to earth. Thank you and your team so much for all your insightful advice and great marketing work. I couldn’t be happier. The price was right on my ‘dream price’ which was $150,000 above where I thought we’d end up. I’ve been reflecting on the campaign and the pre campaign advice you gave me over the past year. Everything was spot on. In fact you could probably call yourself a stylist as well. I was impressed that you focused on the practical outcomes – styling to sell. As you will recall, I did everything you recommended: floors sanded, new carpet, new blinds, new lighting, kitchen upgrade, painting inside and out, hired furniture and décor. That turned out to be satisfying too, because everything was up to you! I also recall our pre-styling offer and the pre-auction offer which were $375,000 and $250,000 respectively below the ultimate sale price. If you have trouble persuading future clients of the benefits of ‘dressing up’ please show them this letter. The return on my styling and modernizing investment was almost 3:1. Today another agent sold the house across the road. I’m lucky I chose Marshall White and you in particular. All the best. Our sincerest appreciation to your firm for an outstanding, professional, yet personal approach, and the outstanding outcome achieved in the sale of our home. Your team are to be commended. Nick Franzmann and Stephen Gough were particular in their thoroughness and committed during the lead up to the auction. They exceeded our expectations despite some uncertainty (on our part). Nick’s approach on the auction day showed a level of creativity and commitment that deserves a special mention. I have watched many auctions over many years and never seen or heard of the honest, direct and highly successful approach he used to assist the eventual purchasers. Our auctioneer Antony Woodley did an exceptional job. Energy and engagement are two of his critical tools and he demonstrated these in spades. I never expected to be on the receiving end of $100k jump bids! I would have no hesitation recommending your firm in the future. I also negotiated the purchase of a property through your firm within an hour of our auction and again, I appreciated the quality of the engagement with James Tostevin. We would like to express our appreciation of the experience and wide local knowledge by Stephen Gough throughout his recent handling of the auction of our family home in Victoria Avenue, Canterbury. It was a major decision for us to sell out house after 25 years, but Stephen was always reassuring and on the day of the auction achieved a sale price for us that exceeded our expectations. Stephen’s knowledge not only of the housing market in out area, but also the current state of the Melbourne market generally was spot on. A much appreciated strong point was your communication efforts and skills. On our side, you communication was constant and clear. I think we were in touch nearly every day during the campaign and it was as much your initiation as Catriona's or mine. Before the campaign, you gave us excellent advice and references for the tradespeople we employed to put the finishing touches on the property. As a result, we were confident, as you affirmed, that the property was displayed to its very best advantage. The large numbers who came to the house during the campaign attest to the effectiveness of the advertising, as well as the great photos. As you know, selling a house is very stressful for the vendors. We greatly enjoyed your humour and thoughtfulness for the whole family during this time. Your communication with the possible purchasers was excellent as well. We could tell that from our experience buying with you as agent, as well as the clear and concise way in which you described each of the people who came through the property. Crucially you gave clear and insightful descriptions of their reactions to the property. Although the news on reactions to our house was not always good, the feedback was consistent with reality. This indicated that you attracted discerning buyers, just the ones we hoped would make a competitive auction. Sadly, this was not to be – but our strong efforts together gave us the reassurance that we had tried our hardest. All of us agreed that the floor plan – which of course we could not change! - was the main reason for this disappointing result. It was the post-auction efforts that we want to thank you for most. You reassured us, arranged the post-auction inspection on the Monday, contacted all the possible purchasers and then followed up with a lot of work on the possible. It was very impressive that we had an unacceptable offer on that Monday, which you turned into an acceptable one in just 48 hours. The $50,000 extra that you achieved seemed close to magic to both Catriona and me. Overall, your performance was outstanding. Ironically, achieving a result which was just a small amount below the expectation at the beginning was, at the end of the campaign, an excellent result. And we were very satisfied by dint of your hard, creative and imaginative work that this was the best result possible, With thanks, hope that we won't need your services again for a long which and assurances that when we do, we'll return to you. As you know, we invited five different agents to tender for the sale, and ultimately chose you to handle the transaction for us. We were very pleased with quality of service we received, from excellent photographs and the impressive advertising campaign, to your unfailing sense of confidence in achieving a successful outcome. I would like to thank you for successfully selling our property recently in Hawthorn East. You showed true professionalism throughout the entire process. Your constant communication with us was very reassuring and your reliability was faultless. You sold our house very quickly prior to auction and exceeded our expectations in regards to the result, especially considering there were only a handful who showed up to each open inspection. You are gifted with a personable demeanor and always showed discretion under difficult circumstances and I would highly recommend your services. You are definitely the best real estate agent I have ever had dealings with and I simply cannot fault your efforts. You are most definitely a huge asset to Marshall White and I wish you continued success in your field. We both wanted to take this opportunity to express our ultimate gratitude for your efforts in the recent sale of our house. Being involved in the property industry ourselves we felt we employed the best agency for the sale that resulted in an outcome that exceeded our expectations. Our objective in appointing an agency was to find the mot experienced agent who understands buyer behaviour and work ethic to achieve the best result for the sale of our property. At any stage you require a glowing recommendation from prospective clients, please feel free to have them contact us personally. I was in constant contact with Stephen Gough who I found to be pleasant to deal with, efficient and dedicated to the task and most important of all successful in a short space of time. I feel that the whole process was as painless as possible. Stephen Gough & Kathy Malcolm looked after the sale of our house from start to finish. They were both absolutely fantastic. They spent hours with us reassuring our concerns and helping in any way they could, including preparing the house for sale, helping present the house for inspections and always keeping us informed of the feedback. We actually went away during some of the campaign and both Stephen and Kathy made the whole process so easy for us we did not need to worry while we were on holidays. We were very happy with the end result and would not hesitate to recommend them to anyone interested in selling. Since being referred, by my financial adviser to using Marshall White, I felt immediately that after meeting with you, that you were the ideal person to handle the sale of my home. Your friendly and professional approach made it easy to see your talent for real estate sales. The price obtained for the property was higher than I ever expected to achieve for it. What you promised, you delivered. I found your overall approach to the marketing and auction sale thoroughly professional and attuned to the current achievable market prices. You were always available to answer any questions or queries I may have had to selling my home which makes me comfortable to recommend you to my family and friends. Again, I thank you personally for your efforts Stephen and the friendly service of Marshall White Real Estate. We would like to thank you and your team for the extremely professional way in which you handled the marketing and sale of our home. As you know we interviewed several estate agents, including a leading competitor with whom we already had a relationship. However we were so impressed by your initial presentation and the thoroughness of your follow-ups, that in the end we decided to appoint Marshall White to the job. Over the course of the preparation-for-sale period we were delighted by the various consultants and contractors you appointed to assist us in the preparation of our home for sale. This is an invaluable service, especially at such a stressful and chaotic time, and we were delighted with the results of their input. During the marketing campaign itself, right through to the successful sale of our home at auction, we continued to be impressed by your regular detailed communications with us, your useful feedback and your considered advice and guidance as the campaign progressed. In the end, what we vendors really want from an estate agent is an outstanding level of personal service and to achieve the best possible price for our properties. We can say unequivocally that you fulfilled both these requirements admirably! I would like to take this opportunity to thank you and the rest of the Marshall White team for the tremendous job you did for us in the marketing and sale of our home at 10 Cole Street Hawthorn East. I did not think that there was much involved in the process of selling a property. How wrong I was. I found your organisation to be totally professional when dealing with a prospective buyer as we were on the market to purchase a property so I have seen your performance from both, as a buyer and a seller. Unlike your competitors, you were honest in your appraisal of the property and we knew where we stood from the beginning. You guided us through the maze of advertising, photography and makeovers. All the people you engaged were professional and always on time. The whole campaign went through rather smoothly as your approach and that of your team was first rate. We were kept informed at all times and received constant feedback from all the open-houses and to who the potential buyers were. Stephen, I would not have any trouble in recommending you, Sam and your team at Marshall White as we cannot repay you enough for what you have done for us. It is not only the fact that the result was more than we could ever expect to achieve, it was the way you conducted yourself throughout the whole process that put us totally at ease. It was a pleasure in doing business with you. Many thanks for the professional and thorough way you handle the sale of my house. I was extremely happy with the result which in the current market was such a relief. I will certainly be recommending you to all of my friends and family. I would like to thank you for selling my property. This is the second time we have worked together and each time we have exceeded the expectations of almost everyone. No doubt if a third opportunity arises you will be the first agent I contact, I will also recommend you to any friends who are interested in selling a property. I am both pleased with the outcome and the efficient way you handled it. I wish you every success in the future. I write to let you know how much I have appreciated your very professional work that culminated in the sale of my late mother’s unit in Camberwell. I decided to appoint you as my agent because I thought that you had the expertise I needed and that your approach would suit me. During the whole process, this option was well confirmed. I am very happy with both the conduct of the whole process – and with the outcome. Your initial advice about the scale and nature of the redecoration appealed to my husband and myself, and you were able to explain clearly why you thought it was appropriate. You recommended that we consult a presentation service and recommended Sue O’Callaghan of House and Garden Presentation services. The information you gave us about her was accurate and to the point, and we were very happy indeed with everything she did. We are very glad that we followed your advice and hers. The marketing plan and schedule were well explained and suited our needs, also the details of the Exclusive Authority. Throughout the “campaign” you kept me well informed and towards the Auction date you prepared me well for the various possibilities that might occur. At all times, I appreciated that you were prepared to give me your advice without undue pressure, to explain and support your point of view, but also listen to my ideas and to be flexible and/or patient when I asked for, or needed, more time or some slight modification. As the purchase process has not yet been completed, I prefer at this stage not to comment on the conveyancers that you recommended (The Goodman Group) or on that aspect of the business. To date their work appears to have been done in a timely fashion and I certainly appreciate that. We will be very happy to recommend you to others, though we don’t know anyone else selling a house at the moment. We ask you to pass on our thanks and appreciation to Mark Dayman, who did a great job at the Auction, and also Joe Muinos. With our good wishes – and again my sincere appreciation for all your work. Faced with the unenviable task of selling a tenanted property, we were seeking a dynamic solution. As we met with different agents we became increasingly frustrated that we were only offered the stock standard sale campaign over 5-6 weeks will allegedly unavoidable advertising costs. However we were yet to meet with Marshall White who we consider as one of only a small number of agents you would consider to assist with selling a property in Boroondara. 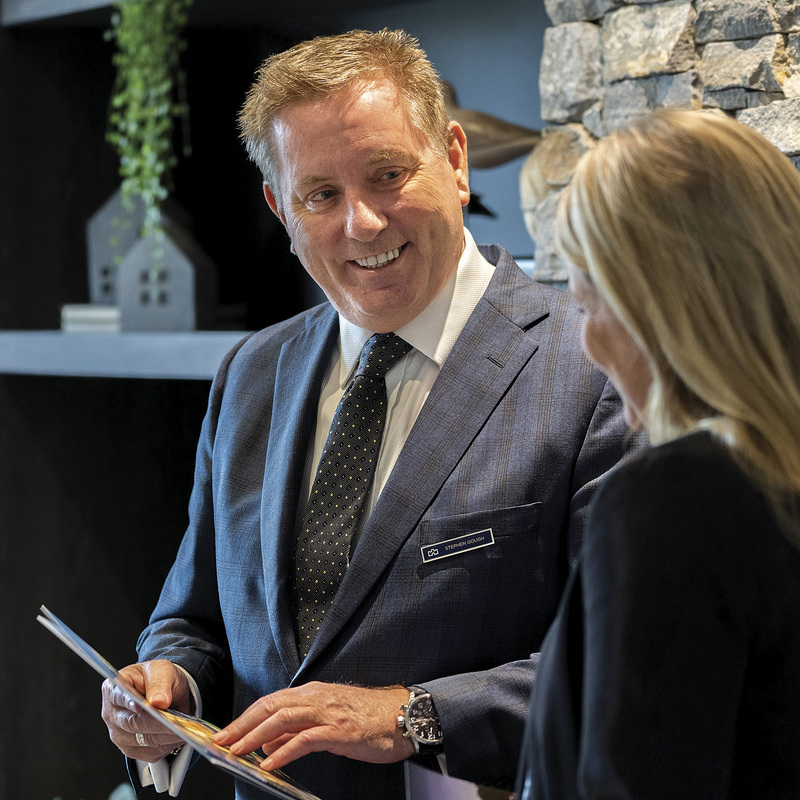 We had known Stephen Gough of Marshall White, Hawthorn for many years as I had inspected numerous properties in Boroondara hosted by Stephen and were therefore well aware of his previous success. We met with Stephen to discuss the potential sale of our property in Hawthorn East and outlined our concerns - tenants, 6 week campaign, 8 opens, advertising costs, 60 day exclusive authority, etc... A few days after our initial meeting Stephen called me to suggest a 3 week authority with one 30 minute open for inspection where he would utilise his extensive database of potential purchasers to generate as much interest as possible. We agreed this was exactly what we were after. On day 5 Stephen held the open where he had 10 groups go through. On Day 7 he had several interested parties. On Day 10 the contracts were signed and the property was sold at a price that exceeded our expectations. We would like to take this opportunity to first of all thank Stephen for his willingness to listen and adapt, his highly professional approach and his energy and eagerness to achieve a successful outcome. We would also like to take this opportunity to recommend Stephen to those considering selling their property - be it a stock standard approach or a fast track. Either way I am confident you will achieve a great outcome. Thank you Stephen. Thank you so much for the friendly and professional way you handled the sale of our property. We know that when you first saw the house it needed much work to get rid of the clutter and make it presentable. After a weekend of backyard blitzing with a group of our friends from church we certainly achieved a lot to get the house ready for the marketing campaign. Given the outstanding outcome we have achieved it was well worth it. Importantly we never felt pressured to sell at any price just so you could get paid, and your understanding of what the market might bear (which aligned with our views) meant that we were happy to appoint you over the competition. Thank-you, Stephen, for seeing us through the sale of our home in Camberwell. We had a very tight deadline, coupled with a fair amount of stress, and you managed to remain unflustered and deliver within a very short time frame. Thank you also for your advice regarding the presentation of our home, and your honest approach to valuations and expectations. You were spot on. You provided welcome support on Auction day as well and we were very excited to be able to stand in front of the auction sign, cameras and a 'sold' sticker in hand. Enjoy a well earned break over the holidays, and we wish you all the best for a safe and successful 2013. We would like to take this opportunity to sincerely thank you and Michael Liu for your professional approach in relation to the sale of our property. As you are aware we had a very distressing time with Jellis Craig and found your advice, service, follow-up and communication were outstanding by compassion. Your attention to detail and honest valuation process was refreshing and welcome. We wish you and Marshall White continued success in the future. A belated thank you! Thank you all so much for your astute advice and superb effort in selling my home at 1A Union Road Surrey Hills last year! The outstanding result achieved has enabled me to move from one of Melbourne’s best suburbs to an even better one, the best sort of outcome, albeit in a tight market. You came highly recommended and I would recommend Marshall White unconditionally to anyone considering selling their home in Melbourne’s inner east. When it comes time to move from my present home, I wouldn’t hesitate in seeking your advice and expertise again. At all times, you and your team, Kathy and Joe, acted professionally, honestly and ethically…and as friends. Marshall White’s sales methods were accountable and transparent throughout. I trusted you to show people through my home and was pleased with the targeted results that you achieved in a difficult sales climate. The auction was conducted with aplomb and your after-auction negotiations were astute and achieved a well-advised outcome. Above all, I consider you and your team at Marshall White, friends. Thank you, good luck and best wishes to you all.. I hope that we have the chance to work together again in the future. Just a note to thank both you and James for your efforts in achieving a most successful result at our recent auction. The fact that such a good result was achieved despite the current economic crisis, was a tribute to your marketing and promotional efforts, and to have 5 people bidding on the day was amazing. Thanks once again for your assistance. The auction of 7 Birrell Court, Kew was run really well, the lead up was also very well done. Your strategy at auction at $1.350k (to strategically pass the house in) was against my instinct, but this squeezed another $60,000 from the crowd, so I’m glad I followed your advice! Many thanks to the team. Just a note to thank you for all of your efforts in selling 9 Orrong Crescent. We realise that it was a little difficult trying to keep the tenants happy whilst managing open for inspections. The house was not the easiest to sell as it is completely un-renovated, but you must have painted a good picture of its potential. Your advertising strategy worked really well and it was great to get the on-going feed-back each week. It gave us confidence that all was under control and the campaign was going according to plan. On the day we were fortunate with the weather and Hamish did a great job auctioneering the property. He certainly knows how to run an auction to generate very competitive bidding. We were ecstatic with the result. We engaged Stephen Gough from Marshall White to sell our house in Kew. We liked Stephen’s approachable and easy going manner. Stephen is an excellent communicator and was very proactive in keeping us informed of progress right throughout the marketing campaign. He always made himself available for questions and progress updates. We appreciated his insight and experience in suggesting we go for a board room auction some 10 days before our designated auction date. It turned out to be a very good decision as we had 8 bidders at our board room auction. We were a little unsure whether we go for the board room auction but we were very impressed by the way Stephen worked the phones and corralled all the real bidders into the board room auction process. We would not hesitate recommending Stephen and Marshall White to friends and family. Now that the sale of our property at 727 Canterbury Road, Surrey Hills is complete, I am writing this note to you to express Pauline’s and my appreciation to you and your team at Marshall White for your help, advice and support during what can be a stressful and challenging time. Your experience and professional calmness throughout the campaign was much appreciated by both of us. We always felt confident in allowing you and Michael to manage the Open for Inspections and especially with yourself talking through the tactics of the actual auction. Your negotiating skills on auction day impressed us both and I am sure helped us all achieve a pleasing result. Choosing a real estate agent is a difficult decision but in this case I am satisfied we made the right choice as you and your team at Marshall White certainly delivered the goods. Please pass on our thanks to everyone involved during our campaign. Thank you and regards.